See’s Candies $25 Giveaway! Yum! See’s Candies opened in 1921 as a small family business dabbling their hand in confections. Today, “California’s Famous Old Time Candies®” are sold in over two hundred shops throughout the country! It must be good! We don’t have a See’s near us, but that is okay, because they have a great online selection! Wait to you see these prices. They are fabulous and perfect to send out as gifts or to munch on yourself. They only use the best ingredients, never adding preservatives! My order arrived and I couldn’t wait to dig in. To have a bite of everything, I made a dessert plate for the family that we passed around. Toffee-ettes ~ bite-size pieces of rich Danish butter toffee with whole almonds are smothered in creamy milk chocolate, then covered with bits of toasted almonds. Trick or Treat Box ~ a special assortment of milk and dark chocolates nestled in along with Milk Chocolate Foil Balls. Halloween Orange and Chocolate Creams ~ milk Chocolate Buttercreams are topped with smiley pumpkins and sweet little ghosts atop tangy Orange Creams made with real orange. Pumpkin Pie Truffles ~ sweet, spicy flavors of cinnamon and allspice combine with the rich mellowness of real pumpkin. One really cool choice, which I will probably do next time, is the Custom option! You can mix and match any piece of candy and lump it in one box. 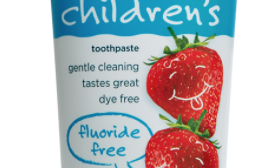 A great way to try the multitude of yummy flavors! I know you want some! Check out Sees.com for the great selection and prices! I got all of this for under $50! WIN $25 to See’s Candies! I received this products for review and all opinions are my own. This giveaway will end on November 7, 2012 at midnight EST. Winners will be drawn via rafflecopter. Once a winner is drawn I will contact them and they will have 48 hours to reply before I draw a new winner. Giveaway is open to anyone in the US and you must be 18 years of age or older. Giveaway not affiliated with Facebook & I release them of liability. Winner will be posted in the rafflecopter widget. The California brittle looks good to me. I am familiar with them and that Pumpkin Truffle you mentioned sounds really yummy. I've heard of it around the blogosphere, but I'd love to try some of their chocolates with nuts. Bring on The Pecan Pie Truffles anytime! never heard of them but dang, everything looks delicious. Just go right ahead and send some my way to taste test, lol. Seriously, looking yummy. Thanks for the intro to them. 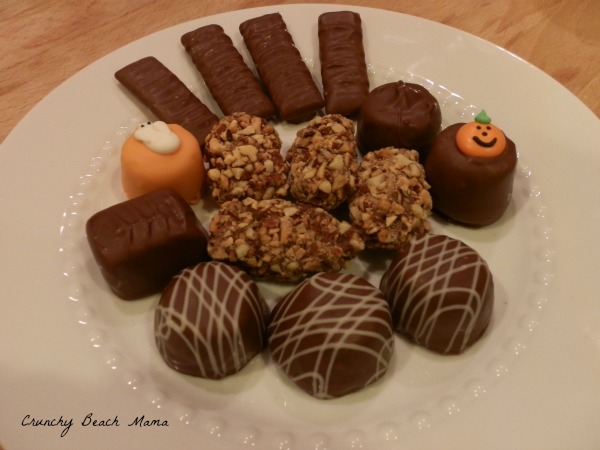 I haven't had their candy before but the Pumpkin Pie and Pecan Pie Truffles look awesome! I have not tried See's before, but I bet I would love the nuts and chews. I adore Sees Candies! My Grandmother always gave us the 2 layer box of candies for Christmas! I still remember the distinctive wrapping paper from Sees! They make everything delicious! I love their nougats! Thanks for this sweet giveaway! I haven't heard of this company before, but all their treats look wondrful. Yes, I love See's candy's. Their toffee is delicious! I have heard of them, but have not tried them yet!! See's Candies is my favoritest of favorite candy ever!! I could live on their milk chocolate Bordeaux candies. Or the Toffee bits. Or the butterscotch suckers. Or the Raspberry Truffles. Or the Scotchmallow bars!!!!! Oh, I really need a pound of soft centers right about now. Thanks for reawakening the craving! I'd never heard of See's candy before moving to AR. Even then, it seemed like it was something people who moved here from the West coast seemed to miss and enjoy. I've tried a few of the chocolate bars that kids have sold for fundraising and I did like them. My fav are those english toffee ones you have in the middle yumm! I would like any of their chocolates with nuts in them. We used to always get See's Candies at Christmas. I don't think I could pick- it all looks good! Probably any chocolate bars with nuts in them. I would get my husband the sugar free dark walnuts. I want some pumpkin pie truffles...yummy! We have See's here in Oklahoma so I am slightly familiar. 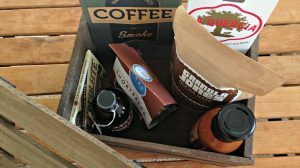 I would buy stocking stuffers for the kiddos or a gift for parents for Christmas or a family sampler to share for Thanksgiving would be fun too! I am not familiar with See's Candies but I want to try the Pecan Buds! I love See's truffles. My favorite is the razberry one. I love See's, I would want Toffee. Yes, I have heard of See's I would love to try the 1lb. Dark Nuts and Chews chocolate assortment. I must have their Bordeaux™ Pecan Fudge!!! It has been a lot of years since I've eaten See's Candies. I would love love love to try the pumpkin pie truffles! The Pecan Buds look good! Milk Chocolates box would be nice. I haven't heard of See's before! I would love to try the Scotchmallows! I like See's Dark Nuts and Chews. I must try the toffee-ettes! I LOOOOOOOVE See's! My favorite are butterscotch squares. mm! Peanut brittle and toffee ettes. I love See's, especially their Lime white chocolate! I have not had them yet, but have heard great things about their Nuts & Chews. The pumpkin pie truffles look awesome! First tasted See's when I lived in California 30 years ago. I miss having a See's near me on the East Coast. I live very close to Seattle so YES I know about See's!! My favorite is their pumpkin pie truffles! I love the maple pecan bon bons !!! I am familiar with see's candies and I really love their fudge! Love them Love the chocolate and nuts! I've never had See's. I'd love to try! I love sees. I really want to try that pumpkin pie truffle! I've seen a new store open near us but I've never tried See's Candies. I grew up with sees!! Love the chelsea candies, the vanilla lollipops and would love to try pecan pie truffles!! I am familair with them and you're right what a great selection and the prices are awesome! I buy See's candy in the mall at Christmas time. I like their sugarfree peanut brittle. 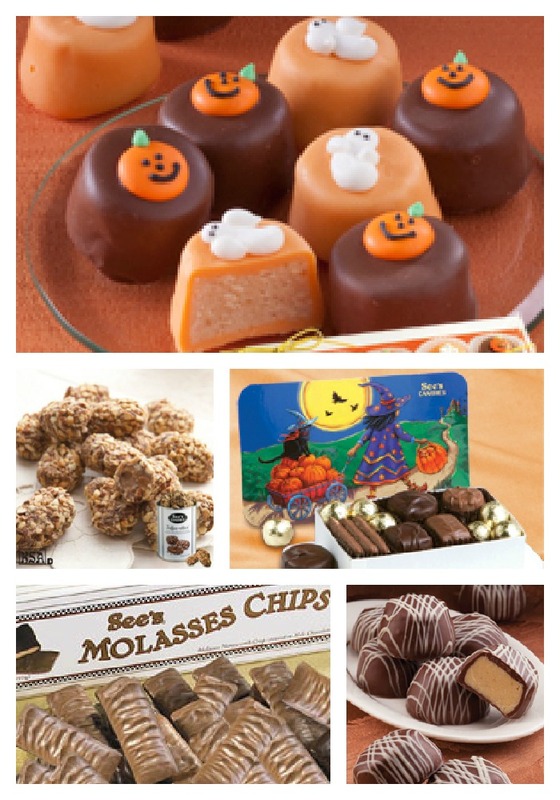 I love, love, love See's candies; I would buy the Dark Bordeaux candies box. Yes I am familiar. Yes I am praying to God that I win this :) It's all soooooo good! I live in the Pacific NW so I grew up with See's Candies and I love their Scotchmallows! I love their caramel/marshmallow chocolates. See's has the best peanut brittle! I am familiar with See's Candies and I like their milk chocolate assortment! I have never had it but if there is dark chocolate it has to be yummy. Have a very Happy Halloween! We used to get free samples at the store in Tucson. looks good. Big fan of See's Candy - so hard to pass by a See's store without stopping in! Yes Im familiar. I remember seeing their stores in the mall as a kid and they gave free candy sample! No, I've never had them but I would love to try them! I am very familiar with Sees. I like their chocolate with caramel candy. i love their butterscotch lollypops! I'd probably get their Truffles as a b-day gift for someone! Wow, they have yummy looking stuff! I think I would like to try the dark molasses chips! I like to buy their sugar covered orange wedges. I used to get See's at their store when I lived in Anchorage, Alaska. I would treat myself to some of their truffles about once a month. I've never heard of them, but I have a feeling I'd fall in love! I like See's milk chocolate with nuts and caramel. I like See's nuts and chews. I have heard of Sees but have never tried them. I would have to order some Truffles. Oh melt in your mouth decadence! Love See's - thanks for the giveaway! I want the Fall Favorites Tower from See's candies. They have wonderful products for all occasions. I love See's Candies! Their molasses chips are my favorite. It's been a long time but I have had See's and I remember that is it delicious! I loved the bordeaux candies. Thanks! Yes, I love See's Candies. I want the pecan turtles. Yes, I'm familiar with See's Candies. I like the truffles. Anything that is sugar free! I am not familiar with See's Candies, but I was immediately drawn to the Seasonal Pie Truffles. I would get the Milk Chocolate with Toffee Nuggets Candy Bars. I love See's candies and am very familiar with them. I love See's Candies. Would love to try some new varieties. My grandfather would give my mother See's Candies every Christmas. I would love to win some of their toffee! I love milk chocolates. I do know they have been around forever. One time I found one of their very old heart-shaped satin boxes. i have seen See's featured on TV (foodnetwork i think) so I would love to try their candy! i think i would get the milk chocolate nuts and chews box!! I am familiar with Sees but haven't been able to try as much as I would like! I would love to try the Toffee-ettes! They look and sounds so delicious! Thanks! My favorite candies at See's are the Butterscotch Lollypops!! I haven’t tried See’s before, the California Brittle sounds yummy! The last & only time I had See's candy was when I was 11 in 1981. My Mom had them at her wedding reception in dishes and platters at the venue. I remember not eating the dinner that was served because I could not stop eating the candy-sooo good! I love See's! We used to sell it for fundraisers at my school and my mom used to buy it add gifts at Christmas time! I'd have to go with a sugar free kind.. I've heard of them. I'd like to try their molasses chips. There has been a store around here for a few years now. A friend used to work for them. But never been in. This would give me the incentive to. I used to go to Fannie may all the time when i was a kid but when the company changed hands and changed recipes and got rid of some of the favorites I quit going. This could be my new candy store. I love milk chocolate nuts and chews! I really love everything See's makes.... very Yummy to the tummy !!! We don't have See's around here but my mom went to high school where Mrs. See's taught and handed out chocolate as gifts. I haven't ever had them but really want to try their vanilla creams.